Sealing Machine is made compact & versatile. 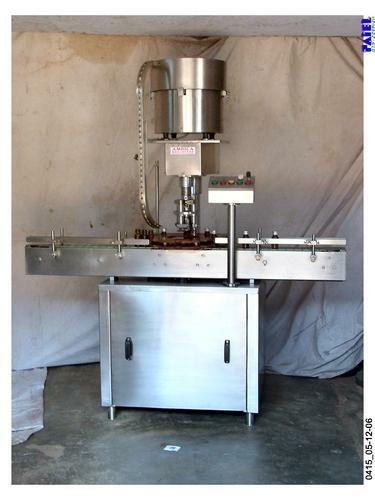 Packaging Details Description: The Automatic Cap Sealing Machine is precision built on sturdy welded steel frame completely enclose in stainless steel sheet (SS 304) and doors are provided to facilitate the servicing of machine. Operation: The feed container moving on conveyor belt are fed into star wheel/ bringing the container below the sealing head in the subsequent indexing part/ mean while the bottle pickup a cap from the delivery chute of cap feeding bowl/ where the body and the neck of the container are positioned below the rotating head. Where the sealing head is performing perfect operation of threading & sealing/ rotating head is design to seal container according to pre-set torque. Electrical: Main Machine:- 1 HP Three face motor/ 415 Volts / 50 Hz. Gearbox of 40:1 ratio. Electrical panel box with circuit breakers. No Bottle no capping process switch. Cap Feeding Bowl:- 300 Watt/ Magnetic coil Machine Dimension: 1525mm(L) x 850mm(W) x 1900 mm (H) approx Height of Conveyor: 860 mm to 910 mm adjustable. Output/Hour*: 1000 to 3000 bottles. Net Weight: 350 Kg. Gross Weight: 550 Kg. Salient Features: No container No cap arrangement. SS elegantly matt finished body. Single motor synchronizes conveyor/ star wheel/ & platform turret. Adjustable height of conveyor belt/ to align with other machine of the line. Sealing pressure can be varied to suit different gauges and size of caps. Low noise level/ low power consumptions. Self-lubricating guide profile for low friction wears surface/ smooth and noiseless conveying. SS cladding or chrome plating of all exposed parts to ensure long life and resistance against corrosion. Synchronized A/C drives to synchronize/ Conveyor/ Star wheel and Platform turret & capping bowl. Adjustable bottle height gauge for easy and quick setting. Established in the year 2001, we "Ambica Engineers, Gujarat", have gained huge domain expertise in offering various machines and spares. We offer Liquid Filling Machine, Packaging Machine, Powder Filling Machine, Measuring and Cuplacement Machine, Automatic Viscous Liquid Filling Machines, Capping Machine, etc.. These are catering to the requirements of diverse industries such as pharmaceuticals, chemicals, cosmetics, food-beverages, and packaging industry. We are following trustworthy quality strategies in our company to ensure that only precision engineered range is delivered at clients end. Owing to our client-centric approach and aim to expand our business horizons, we have been able to gain prestigious clientele based in countries such as India, Bangladesh, Pakistan, Sri Lanka and the Philippines.